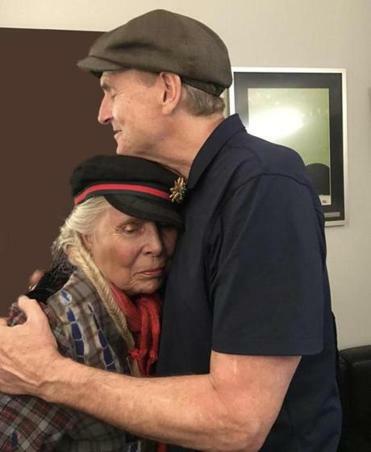 Longtime friends Joni Mitchell and James Taylor shared a hug backstage at the Hollywood Bowl in Los Angeles. James Taylor was a long way from his home in the Berkshires this weekend, playing two shows at the venerable Hollywood Bowl in Los Angeles. And there was something for everyone, from a rousing version of “Mockingbird” — on which opener Sheryl Crow performed the part sung by Carly Simon on the original 1974 recording — to classics such as “Sweet Baby James,” “Fire and Rain,” “You’ve Got a Friend,” “You Can Close Your Eyes,” and even “Something in the Way She Moves,” which JT played for Paul McCartney and George Harrison in 1968 before signing with Apple Records. But the most precious moment took place off-stage: Singer Joni Mitchell, who’s become something of a recluse of late, made a rare public appearance to say hello to her old friend and onetime lover. The pair shared a tender embrace backstage, and despite reports of health problems in recent years, Mitchell looked terrific with her hair fixed in an exquisite fishtail braid. Taylor and his All-Star Band, which includes Steve Gadd on drums, Jimmy Johnson on bass, and Michael Landau on guitar, concludes the US portion of his world tour at Tanglewood July 3 and 4 before heading to the UK, where he’ll perform in Hyde Park July 15. Here’s a clip of Taylor and Joni singing together back in the day.